We've got a few days left until Christmas Day. The tree is decorated and Sweetheart and I are as ready as we will ever be for Christmas 2013. This Christmas celebrates our 54th Christmas together. Also on Christmas Day I will have been blogging for 4 years. Wow! Blogging has changed so such a short time. The Angel Tree has a little different look from last year. Baby's Breath is tucked in the branches. This year we bought a new tree. I also added more lights. When Sweetheart and I became Empty-Nester's 24 years ago, I gave the old family ornaments to our children. I started a new collection of angel ornaments and bought our first artificial tree. Over the years I have collected so many I didn't put them on all the tree. The little white feather tree is in the living room this year. Last year the feather tree was in the kitchen. I have some new things in the kitchen to share. I'll have a Christmas Kitchen tour tomorrow. A little recap of our CHRISTMAS TREES. I will be visiting some wonderful friends. How very bright and lovely your home is! It's just so welcoming and warm, and that mantel is absolutely gorgeous. I've joined as a follower and look forward to returning, especially to read about your England/Scotland trip---I got to visit several years ago, and love to reminisce, and to see things I missed. Hoping you the most wonderful Christmas! I just love your Angel tree! And mantel with the gold and silver is just gorgeous. Lovely decorations, very festive. Merry Christmas to you and your family! I Wish you and yours all the best in 2014! 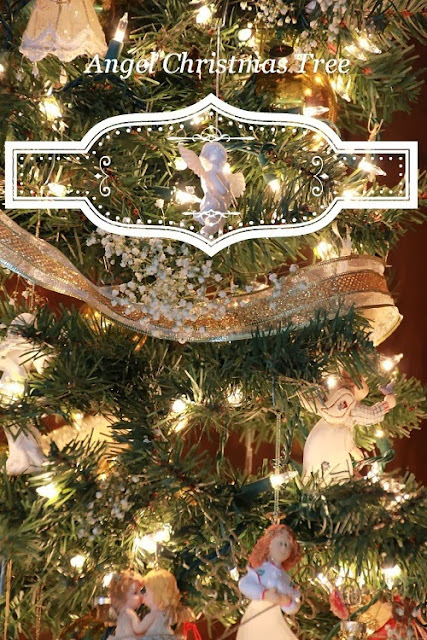 Your angel tree is beautiful with the baby's breath. So airy. Your decorations are lovely. This looks SO pretty! 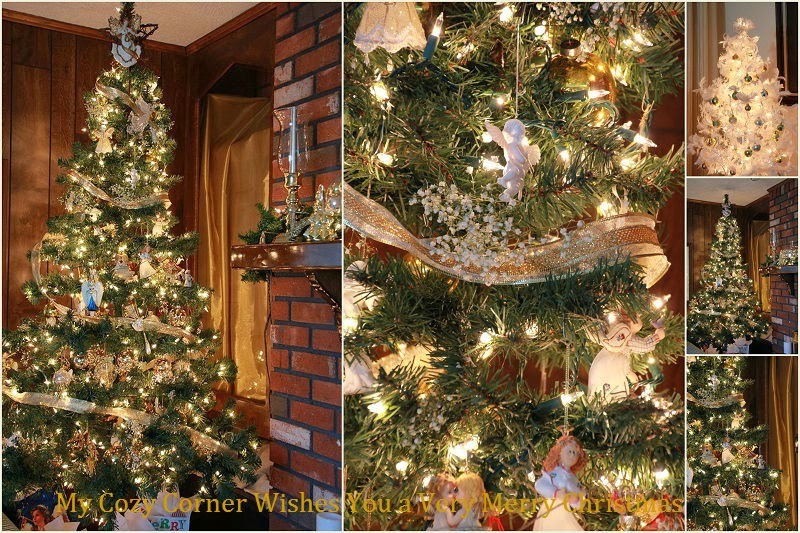 I love the tree, and all of the decorations are perfect! Merry Christmas and all the best to you and yours for a wonderful holiday!